Today, CompStak’s data was used in an article in the Wall Street Journal. The full article text is below, or you can read the article at WSJ.com here. CBRE Group CBG -0.19% won the top spot this year in the unofficial competition among brokerage firms to complete the most big-office leasing deals, representing the tenants in three of 2012's five biggest transactions. Newmark Grubb Knight Frank finished a close second by representing the tenants in the other two top-five deals. In what was a roller-coaster year for the real-estate industry, office rents gradually increased but many tenants held off making big commitments as they tried to navigate an uncertain economy. The biggest deals were especially valuable because they produced big commissions. 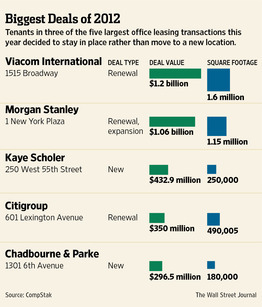 For example, in this year's largest deal, Viacom InternationalVIAB -1.23% renewed its 1.6 million-square-foot lease at 1515 Broadway in Times Square. The value of the 15-year deal was about $1.2 billion, according to CompStak, a real-estate data service. The deal would have produced a $36 million commission for the CBRE Group Inc. brokerage team that negotiated it, headed by Michael Laginestra and Scott Gottlieb, under the standard commission formula used in the commercial-real-estate industry. But commissions on large deals, especially in the case of renewals, often are negotiated by brokerage firms and tenants and wind up being less than the standard formula would produce. A spokesman for CBRE declined to comment on the value of the commission. The total value of the top five deals this year was $3.4 billion, down from $4.5 billion for the top five last year, according to CompStak. The total square footage of this year's top five deals was larger than last year's—3.76 million square feet versus 3.1 million square feet. But their value was less in part because the lengths of the leases were shorter. The numbers reflect a more conservative attitude on the part of tenants this year. Many were focused more on limiting costs and less on making aggressive moves, like leasing space in a new development. CBRE represented Kaye Scholer, as well as Viacom and Citigroup, C -1.14% both of which renewed leases in their current locations. Matthew Van Buren, president of CBRE's New York Tri-State Region, said all three companies "looked extraordinarily hard at new space." But, he added, "Every deal is a compromise of factors. The economics were so compelling that they decided to make existing space work." The past year was especially big for Barry Gosin, chief executive of the newly formed Newmark Grubb Knight Frank, whose deals for Morgan Stanley MS -0.84% and law firm Chadbourne & Parke LLP both made the list. That's a total value of about $1.3 billion, or a potential commission of some $39 million under the brokerage industry's standard formula. Mr. Gosin couldn't be reached for comment. A version of this article appeared December 24, 2012, on page A18 in the U.S. edition of The Wall Street Journal, with the headline: Fight for Bragging Rights.